Insects > Ladybugs > Who is eating my plants? Aphids are sucking insects in the order Homoptera; aphids are small, soft-bodied, pearl-shaped insects that have a pair of cornicles projecting out from abdomen. Aphids are various colors including black, green, red, yellow, pink, white, brown, grayish, or lavender. Complex life cycle: Over wintering eggs hatch in the spring into wingless females. These wingless females are parthenogenetic. Their offspring are similar to the females, but some develop wings. Near autumn, male and female wingless forms are born. These mate and the females lay fertilized eggs for over wintering. Males can be winged or wingless and parthenogenic females are usually wingless. In warm climates, living young may be produced continually with no over wintering egg stage. 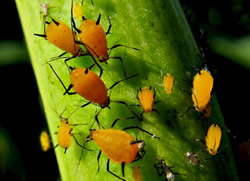 All aphid life cycle stages can cause damage.